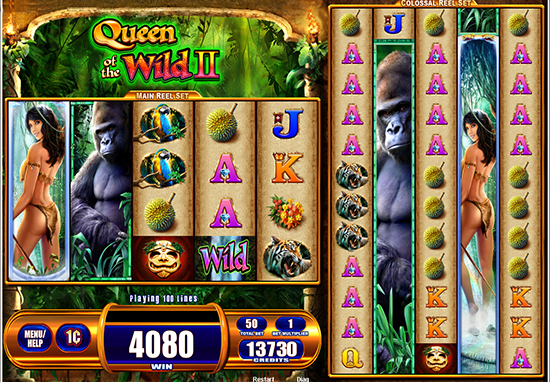 Jungle themed Queen of the Wild II slot online from WMS. This is a rather unique one from Williams Interactive slot game developer. Queen of the Wild II slot is a jungle adventure themed slot game with a rather large difference. This difference is the colossal reels that are featured in the game. This presents itself as 5 smaller, regular reels and five elongated colossal reels alongside this. Together these reels adopt 100 fixed pay lines and a whole series of thematically sound symbols that can score some decent wins. These symbols aren’t fixed to any specific sizes and so larger icons taking up the full size of even the colossal reels is possible. The sound effects are rather great, with jungle sounds and an upbeat drumming to spur on the players. As far as bonuses go there are a handful of free spins to be won as well as some sporadic visits from possibly elongated Wilds. Definitely a twist on the normal gameplay but makes for some fun playing. With such a large set of reels and such a popular theme to uphold, Williams Interactive pretty much had to setup with some quality graphics so the players could fully experience the impact of the colossal reels. Of course even with the well themed and nice sound effects and graphics incorporated into this slot, with reels this big it is the symbol thereupon that get the majority of the attention. These symbols are well made, very WMS, and obviously thematically correct through and through. On the reels players will find the likes of wild fruit, birds and few different animals including an intense looking gorilla that comes in full reel symbols. There is also a selection of card symbols that fill in the lower valued wins and of course the jackpot symbol represented by the Queen of the Wild herself. These can all reap some solid wins across the 100 pay lines featured in Queen of the Wild II slot. Though the 100 pay lines are fixed there is still a decent range of betting options through coin denominations. So players with most wallet sizes can give these massive reels a spin. The layout of the slot is also quite well displayed, with wins highlighted just under the main set of reels alongside other important details like free spins remaining, bet size and total wins. A slot, even one this big, still requires a few bonus features to spice up the normal gameplay. Here Williams Interactive have included their two very favourite bonuses. The first of these is the Wilds. These symbols, represented by the word ‘Wild’ emblazoned on a jungle backdrop, can appear stacked as well as take up entire reels, even those of the colossal set. These Wilds switch out for other game symbols to form the best possible win combinations. Another fun feature included on these reels is the one where a grass shroud appears over a set of reels, unveiling the symbols behind when the spin stops. The free spins in this slot trigger quite often and have the added benefit of doubling wins made on the colossal reels during these spins. Overall a good, and large, showing from Queen of the Wild II slot from WMS.